Wedding jewelry is an integral part of the bridal look. 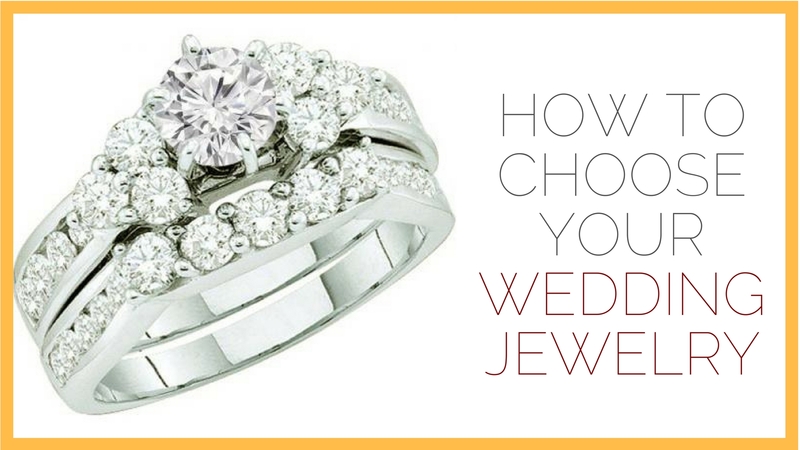 It is your big day, so choosing the right kind of jewelry is important. Choosing bridal jewelry can be very overwhelming. There is an array of styles jewelry available for your wedding day. So it is little difficult to choose the right kind of jewelry based on your skin tone and your wedding dress. It is your big day, so leave no stones unturned to get yourself the best jewelry. The goal is to find the right jewelry items that complete your look and adds elegance to your beauty. Getting the right necklace, wedding diamond band or earring is a challenging task. The aim is to get exquisitely crafted jewelry pieces that are authentic yet do not require that you spend a fortune on them. People often find it a little difficult to get the right jewelry items for the wedding. Follow these quick guide for every bride to pick the perfect wedding day jewelry. 1. Do Not “overdo” It! The very first thing you need to accept is that “Less is more” in many cases. Do not take the risk of overdoing things. Your wedding Jewelry must not outshine your wedding costume; it should rather blend well with the overall look of your bridal wear. For example, if your wedding gown has an ornate neckline, then do not wear a necklace as it may cause the neckline to look too busy. Instead, opt for drop earrings that can complement your look. If your wedding dress is on the simpler side then try to opt for a bold statement by wearing a necklace. Also, be very careful while choosing wedding ring sets, they should match the fabric of the wedding attire. To add a dramatic unique touch to your look, it is not necessary that everything should match. Contrasting in the appropriate manner can make any bride look mesmerizingly beautiful. If you are not sure about whether to choose yellow gold, platinum or rose gold, then it is advisable to go for jewelry based on the color of the fabric of your dress. If your gown is white, then try to opt for platinum or silver pieces.When it comes to ivory, gold jewelry enhances your look the best. If your wedding dress is in hues of pink, then rose gold could be the ideal metal for your jewelry. The fabric and embellishments of your wedding gown can help to provide you with clues about the kind of jewelry you need to wear. Very light beige color wedding attire goes well with burnished silver jewelry. The neckline of your wedding dress is the deciding factor for the kind of necklace you are going to wear. A choker or a shorter necklace is appropriate for dresses with a strapless neckline or sweetheart neckline. If your wedding gown has an ornate neckline, you can go for chandelier earrings and fresh flowers for your hair. To balance everything, do not hesitate to wear a small bracelet, bangle or a cocktail ring to complete the look. V-neck wedding dresses call for choker and pendant or you can even layer both. You can pair the necklace with dangling earrings or studs whichever looks fine to you. You need to choose jewelry in a way that allows them to be highlighted by your wedding dress and not outdo it. Choose the metals of the jewelry keeping the color of the dress in mind. Do not forget to highlight the jewelry that you have worn for your special day. Opting for too many jewelry items can make your entire look messy. So try to choose one single necklace that highlights your entire look and goes well with a heavy pair of earrings and ring. Opting for too many colors for your wedding jewelry is a strict no-no. Try to go for a single or bi-color that blends well with the wedding attire. Multicolored jewelry makes you look messy and steals attention from the overall beauty of the bride. Therefore, if you are planning to have jewelry studded with several different gemstones, then understand that this is a strict no-no for your special day. Try to go for a maximum of two metals for your wedding day. Too many metals can spoil the entire look. Even if you are looking for wedding ring sets, try to go only two metals and not more. Too many metals can simply cause confusion in the look. For example, if you are trying to wear a white gown, platinum or white gold would go well with your attire. These are some of the points that you would need to keep in mind while choosing the right jewelry for your wedding day. Go for reputed jewelers like Dazzling Rock who can understand your needs and offer you the best from their finest collection. This entry was posted in Wedding Jewelries, Wedding Jewelry and tagged Choosing Your Bridal Jewelry, how to choose wedding jewelry, tips to buy wedding jewelry, wedding jewelry, Wedding Jewelry Do's and Don'ts, wedding jewelry shopping tips by Dazzling Rock. Bookmark the permalink. Great advice for a nervous bride. It’s important not to over do it with the jewelry.It should be just right. How Many Pieces of Jewelry Should You Wear at One Time? What Are The Most Important Diamond Characteristics? Copyright © 2011 - 2016 Dazzling Rock. All Rights Reserved.